What is the People Plugin? The People Plugin is a great way to give your users information information about your staff members, leadership, key team members, and more. It provides the ability to include pictures, names, position titles, description/bio/text (via a WYSIWYG), videos (via a WYSIWYG), phone numbers, emails, website links and social media links (Facebook, Twitter, Google+, Instagram, LinkedIn, etc.). What are some use cases of the People Plugin? Introduce your team members and employees to help your users get to know them better and/or find their contact information. If you have sponsors for an event, a company could be listed as a ‘Person’ within this feature. Use the available fields to catalogue or promote business connections. What are the People Plugin’s primary functions and what are the steps to accomplish them? The People Plugin provides some amazing functionality as described in the introduction, but read on to see what some of the core features are and how to set them up. 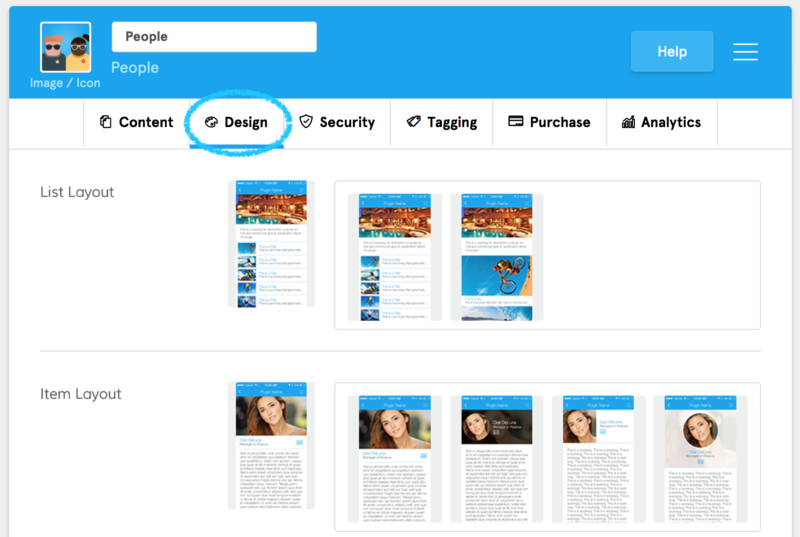 The first two sections inside the People Plugin are the image carousel powered by the Media Library and a Text WYSIWYG which stands for What You See Is What You Get. For more information on these components, we’ve put together dedicated articles, so feel free to check them out. The first fields allow you to add an image, First Name, Last Name and Title/Position. There’s also a Text WYSIWYG for you to add a description, bio, images, videos, or any other useful content. The bulk actions section of this feature allows you to import large amounts of records within a few clicks. This can save you a lot of time if you have a large organisation and want to showcase all of your team’s smiling faces! Using the template will structure your data so you can import it into the system correctly. You can download the CSV template here. Fill out the fields with your information. For the image, you can put an image URL that exists on the web or manually add it to the media library so you can use it throughout the app. For the description info, you can use HTML to include embedded videos, images, and formatting. This step is very important because if you save it as another file type (which your editing program will probably use), the import will not work. The Action Builder is a core component that is utilized across several features to streamline your user experience. You’ll see this component with the image carousel, the footer menu, and when you’re adding contact information. Since this is a core component, we’ve created a dedicated article about how to use the action builder here. In the Design tab, you can choose your feature and item layouts, as well as adding a background if you’d like. Give the different options a try until you find the options that work best for you! Utilize the WYSIWYG (which stands for What You See Is What You Get) in the description to include more than just text, such as videos, images, forms, etc. This is a great way to give your users more insight into who your team is. Some of our clients utilize the People Plugin for more than just staff information. Some of them use it for things like digital bulletins, announcement info, product catalogues, and other things. Use the available fields in a way that works for you. Information on company or event sponsors could also be added into this feature as an example. 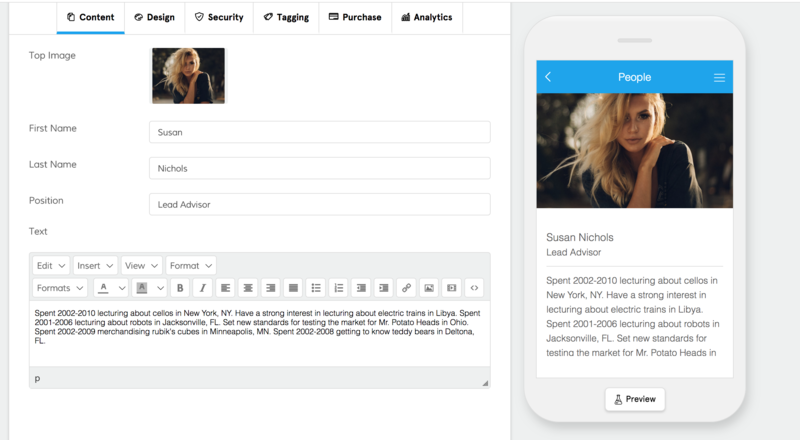 Promotional content, along with the sponsor’s contact information, links to websites or promo pages would work great with the People Plugin.